Hordeum spontaneum Jerf el Ahmar. This figure of selected sections shows the variety of forms of Hordeum spontaneum from Dja'de. 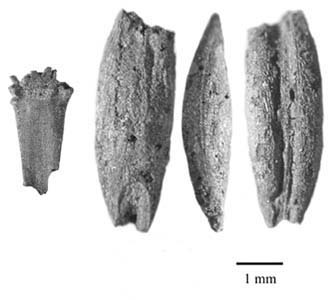 All rachis fragments were of the wild type but grain morphology varied from more domestic forms top left, to wild forms bottom right. 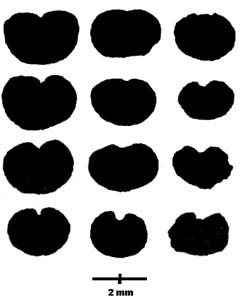 Grain morphology is not a criterion for identifying domestication in this case.